Nutritional Organic Natural Supplement Drink: Flax Blaster PLUS is perfect for autism and GFCF diet -is Gluten-Free, Lactose Free, and Nut Free! Full of foods that help heal our bodies! An all in one dietary supplement with incredible immune boosting power! 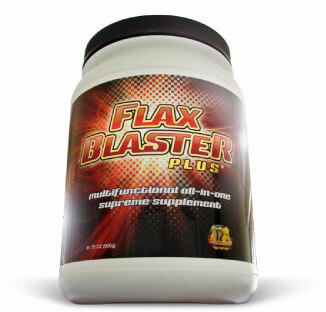 Nutritional Organic Natural Supplement Drink Flax Blaster Plus contains only Superb Natural and Organic Ingredients! Flax Blaster Plus was developed by Debbie Miller, from the Miller Family Farm. She had been working in a government office while remodeling was being done and she was exposed to harmful commercial strength petroleum based chemicals. There was no air circulation in the workspace and she was exposed to these chemicals. Each person in that office experienced adverse effects. In Debbie's case it was her brain, lungs and vital organs that were affected. She had toxic encephalopathy of the brain, fluid on her lungs, swelling at every joint, inflammation along with fibromyalgia. She became allergic to things that she had daily contact with on their farm: foods, animals, the petroleum-run vehicles + equipment. Debbie was so allergic to petroleum products that if exposed to gasoline she would swell up so she could hardly breathe. Debbie used the nutritional organic foods of Flax Blaster Plus to help her body heal and recover. Debbie went through a long process of healing, and has made an incredible recovery. She is now back to her full time role on the Miller Family Farm. Debbie wanted to share with others the benefits of what had healed her body and so, she created Flax Blaster Plus from the purest and highest quality ingredients of foods that heal the body. The Miller Family Farm operates under principles of absolute integrity and hard work and as a result, they have been a blessing to many people. It is a privilege to share a natural food supplement that has the power to help the body heal + prevent sickness. At a time when health care costs are so high + so many are uninsured, each person must prevent illness + maintain their body's highest health. A perfect way to give our body the nutrients and foods it needs is through Flax Blaster Plus -a Nutritional Organic Natural Supplement Drink. It is beneficial for anyone on an autism and GFCF diet as Flax Blaster Plus is Gluten-Free, Lactose Free, and Nut Free! It is a powerhouse of foods that help heal our bodies! So many ingredients are coming from countries where standards are questionable and many things from food to pet food have sickened many. This is one of the many things that makes the Flax Blaster stand out above every other nutritional organic supplement: Every ingredient in the Flax Blaster Plus comes from certified organic and highest quality natural sources. There is nothing in the Flax Blaster that has been outsourced and so, you can be confident that you will not be exposing you or your children to contaminants that you were not aware of. Click for the Incredible Ingredient list of Superb Natural + Organic Superfoods in the Flax Blaster. Click to purchase the Nutritional Organic Natural Flax Blaster Plus Supplemental Nutrition Drink. Back to top of Nutritional Organic.